Arvid Whiting, age 88, of Milbank peacefully passed away on Friday, March 16, 2018. Funeral services celebrating Arvid’s life will be held on Thursday, March 22, 2018, at 10:30 a.m. at Emanuel Lutheran Church in Milbank. Rev. Tim Rynearson will officiate and burial will be in the Milbank Cemetery. Visitation will be held on Wednesday from 5 – 7 p.m. at Mundwiler Funeral Home and continue at the church on Thursday, one hour prior to the service. Casket bearers will be: Kyle Brende, Chris Hanson, Dan Works, Jason Hurley, Chad Hurley, Robin Hurley, and Toby Reiffenberger. Honorary bearers will be Arvid’s grandchildren and great-grandchildren. Arvid Argene Whiting was born on January 14, 1930, in Milbank, SD. He was the son of Mason and Sara (Sternke) Whiting. He was confirmed in 1945. Arvid began farming at the age of 14 after his father’s passing. At the age of 21 he married Mary Jane Folk on February 9, 1951, at Trinity Lutheran Church, Bellingham, MN. After their marriage, Arvid and Mary moved to Inwood, IA where they worked for a farmer until 1953. They later rented a farm by Nassau, MN and farmed independently. In 1956, they moved to a farm in rural Milbank, which became their long-time home and where they raised their family. Arvid retired in 1997. He was a faithful member of Emanuel Lutheran Church in Milbank. 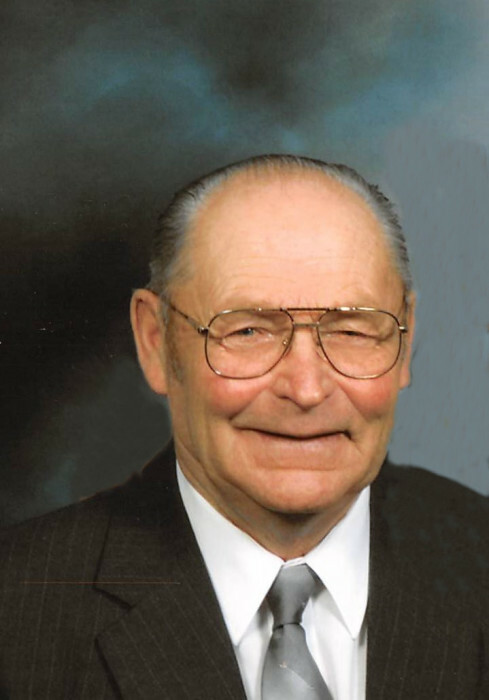 Arvid was a fun-loving and passionate man who enjoyed many hobbies including hunting, fishing, antique tractors, attending swap meets and threshing shows. He cherished time spent with his grandchildren and great-grandchildren. He enjoyed spending time at G&R Auto Shop with friends. Arvid’s passion for antique tractors lead to the opening of Minn-kota Repair in 1986. He refurbished antique tractor steering wheels and miscellaneous parts throughout the United States and abroad. That same year he and his business partner and friend founded the Twin Brooks Threshing Show, which continues to this day. Left to cherish his memory are his loving wife of 67 years, Mary of Milbank, SD; his daughters: Cheryl Hurley of Milbank, SD; and Shirley (David) Reiffenberger of Odessa, MN; his sons: Curtis Whiting of Minneapolis, MN; Calvin (Brenda) Whiting of Sioux Falls, SD; Clayton (Gail) Whiting of Milbank, SD; 9 grandchildren; 12 great-grandchildren; sister-in-law, Mary Ellen Whiting; and many nieces, nephews, and extended family. All will miss this loving father, husband, grandfather, and friend. He was preceded in death by his parents; and infant son; and brother, Orvin.